Alen - BreatheSmart : Air Purifier Review • The Air Geeks, reviews of air conditioners, dehumidifiers and air purifiers. The BreatheSmart is a powerful air cleaner that captures a wide variety of airborne pollutants. In case you have been struggling to eliminate dust, pollen, pet dander or allergens, this air purifier removes airborne pollutants quickly and effectively. It is suitable for large spaces that are up to 1110 square feet. In addition, the BreatheSmart offers intelligent technology, customizable design, and intuitive user controls. Have you struggled to get a suitable air cleaner for your large space? If you answer is yes, then you are in the right place. We have all the information that you need to know about this air purifier. Whether you want to know about it features, performance, strengths, weaknesses, or anything else, we have thoroughly researched to provide you with unbiased information. Without further ado, we will start with its description. The BreatheSmart is a strong air purifier that is based on the HEPA filtration technology. 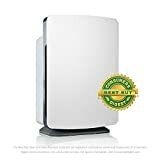 This air purifier captures various airborne pollutants to ensure that your house, conference room, or office is free from dust, allergens, dust mite, smoke, and pet dander to mention a few. This unit is suitable for spaces that are as large as 1100 square feet. In addition, this air purifier is capable of capturing minute airborne particles that are as small as 0.3 microns. In case you are looking for an air cleaner that will be able to capture a large percentage of air pollutants from the air, then the BreatheSmart could be a suitable choice for you. This air cleaner captures up to 99.8 % of airborne pollutants. Are you looking for an air purifier that offers personalized experience? The BreatheSmart offers custom panels, customizable filter options, and an air quality indicator. In addition, this unique air purifier is available in a variety of colors and offers four filter options to meet the unique preferences of different customers. The HEPA-Pure filter captures dust particles and allergens. In case you want to eliminate chemical smell and household odors, then the HEPA FreshPlus filter is the best filter for your air purification needs. The HEPA-Silver filter is the ideal option for capturing germs and bacteria. Lastly, the HEPA-OdorCell filter is a suitable option if you are intending to reduce heavy odor and smoke from your house or office. 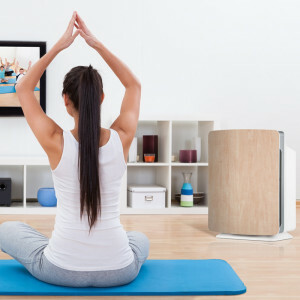 Are you looking for an air purifier that is “intelligent”? The BreatheSmart utilizes SmartSensor technology to ensure that your room is clean and fresh when it is in the auto mode. The intelligent sensor checks the conditions of your room in real time and adjusts the settings accordingly. Its air quality indicator gives you a true picture of the condition of your room. This highly accurate indicator is capable of sensing and displaying even the slightest changes in the conditions of your room. If you don’t want to keep adjusting the settings of your air purifier, then the auto-mode is the way to go. The BreatheSmart utilizes the WhisperMax technology to ensure that the air in your room is cleaned with minimum sound disturbances. It runs quietly and it is therefore suitable for quiet places. In low speed setting, the unit is virtually inaudible. However, the sound is slightly audible when the unit is in the highest speed setting. Nevertheless, the unit does not produce irritating sounds. Quiet operation. We noted that this air purifier is quieter than most units in the market. In the low speed setting, the unit runs quietly and it can be used in quiet places without creating disturbances. However, the unit is audible when it is in the highest speed setting. Personalized experience. The BreatheSmart comes in different colors and offers different filters to meet the unique preferences of different users. Uses only HEPA filter instead of True HEPA filter. The true HEPA filter is capable of capturing a greater percentage of airborne pollutants than an ordinary HEPA filter. However, the filtration system as a whole more than makes up for it. Highly sensitive sensor tends to detect moisture particles as a pollutant. We have observed that this sensor detects moisture particles as a pollutant. This triggers the air purifier to increase the speed of the fan and the air quality indicator changes to yellow and sometimes red. *Punch line: great product, great service, great design, it works. if you want read the rest of the review but that's it essentially* Background: We have dogs and cats in our house and while not allergic growing up, my wife and daughter (and me to a lesser extent) have increasingly gotten allergic to the pet dander especially in our bedrooms. We wake up with itchy eyes, scratchy throats, congested chests etc. We've tried a number of things: anti dander treatment on the pets, keeping the pets out of our room, etc. We even installed a central purifier on our air conditioning system but due to lack of sufficient return air flow, it didn't make a ton of difference though the filters were satisfactorily dirty. Note: this is something they don't tell you when installing a central filter on an whole house AC - it definitely helps clean the air that runs through it, BUT to really pick up the dander one needs a lot of return flow to the unit, not simply the air coming out of the vents. Hence, an air purifier unit on a central AC WILL help however it likely doesn't have enough return flow to make a difference in terms of sucking up all the dander, etc. lying around. Tried one = Researched air purifiers, liked the design of the Alen BreatheSmart, ordered one to see. We were literally astounded by the difference. It was remarkable. Everyone's allergies and morning symptoms vanished. The air smelled fresh and crisp and different. This isn't a puff fake review, it actually really does work remarkably. At this point we can even have the pets in our room at night and it mostly takes care of it as long as they are not sleeping on our heads. We felt kind of stupid for not having tried this before and promptly ordered 3 more." I am a chronic bronchitis sufferer and altho the Breathe Smart is not a cure, it has vastly improved the quality of my life. Especially in the evenings. I sleep sounder and longer with hardly any congestion. My Breathe Smart gets 5 stars, all day, every day." The BreatheSmart is the best air purifier on the market. Suitable for large spaces, it offers impressive features including customizable colors, intuitive smart sensors, and personalizable filters. In addition, this unit runs quietly. Our research indicates that this is one of the most powerful air purifier in the market.. If you are looking for a very high quality product, then you need to consider this air purifier. A must-have.